What is the difference in a stereo and compound microscope? 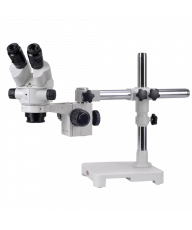 Stereo microscopes, also called low-power microscopes, dissection microscopes, or inspection microscopes, are designed for viewing "large" objects that are visible to the naked eye at low magnifications (under 50x). A stereo microscope provides an upright and unreversed, 3-dimensional image of the specimen. A compound microscope, also known as high power or biological microscopes are used to view micro specimens that are not visible to the naked eye at high magnifications (40x-1,000x). A compound microscope provides an inverted 2-dimensional (flat) image of the specimen. What are high power and low power microscopes? 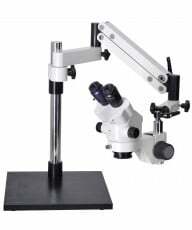 Should I buy a monocular or binocular microscope? Age and budget are the key determinants. Monocular microscopes are cheaper and better suited to younger children whose eyes are not far enough apart (interpupillary distance), to be able to use a binocular microscope. 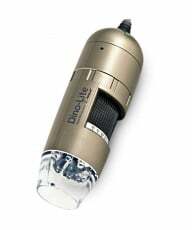 Binocular microscopes afford an infinitely better viewing experience so we recommend binocular microscopes as soon as your child is big enough - or budget allows. What is a zoom microscope? A zoom microscope is a stereo microscope with continuously variable magnification through a range. Similar to the zoom on an SLR camera. What do I need to attach my camera to a microscope? You will need a microscope CamAdapter kit (CAS39) and the step ring that is specific to your camera. Why do you need to start with 4x in magnification on a microscope? The 4x objective lens has the lowest power and, therefore the highest field of view. As a result, it is easier to locate the specimen on the slide than if you start with a higher power objective. How do I calculate microscope magnification? To calculate the power of magnification of a microscope simply multiply the magnification of the ocular lens and the magnification of the objective lens. For a typical compound microscope with a 10X ocular lens and objective lens of 4X, 10X, 40X and 100X magnification, your microscope will have 40X, 100X, 400X and 1000X magnification depending which objective lens you use. The same principle apply to stereo microscopes, a 10X eye piece combined with a 4X objective lens will produce 40X magnification. Some stereo microscopes equipped with continues zoom objective lens with magnification from 0.75X - 7.5X. The total magnification will be 7.5X to 75X when combined with 10X ocular lens. The total magnification will be 18.75X to 187.5X when combined with a 25X ocular lens. How do I take pictures through a microscope? There are three ways to take a photograph through a microscope. 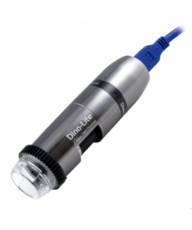 First, you can attach a microscope camera to either an ocular or trinocular port. Second, you can buy a digital microscope with an integrated digital microscope camera. Third, you can attach a SLR or point-and-shoot camera via an adapter and step ring. Should I buy a compound microscope with three or four objective lens? 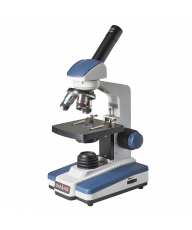 Grades 1-8 typically will buy a monocular compound microscope with 3 objective lenses: 4x, 10x, 40x for maximum total magnification of 400x. More advanced students will buy four objectives including a 100x oil immersion objective,. This requires more sophisticated handling with immersion oil. A diopter adjustment allows you to compensate for any difference between your left and right eyes. With proper diopter adjustment, both eyes will focus at the same focal distance. What is field of view (FOV)? The FOV is the diameter of the circle of light that you see when looking into a microscope. As the magnification power increases, the field of view gets smaller and vice versa. What is meant by depth of field? This is the vertical distance in the specimen, usually in microns, measured from above and below the exact plane of focus which still yields an acceptable image. The higher N.A. the shallower this distance. What is a daylight blue filter? What is this used (or misused) for? The "daylight blue" filter is a filter for observation only. It furnishes a pleasant pale blue-gray background to the field of view. It is NOT meant for photomicrography with daylight color film. Such film requires a blue conversion filter such as the Olympus LBD or Kodak 80A filter. The conversion filter boosts the color temperature of the light source, thus simulating light of daylight color temperature quality (5500 degrees Kelvin) required for daylight balanced color film.